Additionally, the command nominee Adm. Philip Davidson told the Senate Armed Services Committee in a written statement this week that the military urgently needs hypersonic and other advanced weaponry to defeat China's People's Liberation Army in a future conflict. "In the future, hypersonic and directed energy weapons, resilient space, cyber and network-capabilities, and well-trained soldiers, sailors, airmen, marines, and coastguardsmen will be crucial to our ability to fight and win," the four-star admiral said in written answers to questions from the Senate Armed Services Committee. On China's militarization and take over of the South China Sea, Davidson said the buildup of forward military bases began in December 2013 at Johnson Reef in the Spratly islands. Since then, the Chinese have fortified that reef and six others with military facilities, Davidson said. "In the South China Sea, the PLA has constructed a variety of radar, electronic attack, and defense capabilities on the disputed Spratly Islands, to include: Cuarteron Reef, Fiery Cross Reef, Gaven Reef, Hughes Reef, Johnson Reef, Mischief Reef and Subi Reef," Davidson said. "These facilities significantly expand the real-time domain awareness, [intelligence, surveillance reconnaissance], and jamming capabilities of the PLA over a large portion of the South China Sea, presenting a substantial challenge to U.S. military operations in this region," he added. The bases on the seven islands include hangars, barracks, underground fuel and water storage facilities, and bunkers for "offense and defensive kinetic and non-kinetic systems," he states. The militarization contradicts a promise from Chinese supreme leader Xi Jinping not to militarize the South China Sea that is used as a waterway transit for an estimated $5.3 trillion in goods annually. "These actions stand in direct contrast to the assertion that President Xi made in 2015 in the Rose Garden when he commented that Beijing had no intent to militarize the South China Sea," Davidson said. "Today these forward operating bases appear complete. The only thing lacking are the deployed forces." The occupied islands will permit China to extend its influence thousands of miles southward and project power deep into the Oceania. "The PLA will be able to use these bases to challenge U.S. presence in the region, and any forces deployed to the islands would easily overwhelm the military forces of any other South China Sea-claimants," Davidson said. "In short, China is now capable of controlling the South China Sea in all scenarios short of war with the United States." In the East China Sea, China continues to send aircraft and ships to waters near Japan's Senkaku Islands, which China is claiming as its islands. The Chinese have continued a steady level of activity that reflects "China's intent to coerce Japan without sparking a crisis or conflict," Davidson said. China's relations with the democratic ruled island of Taiwan remain tense and any improvement in relations was described by Davidson as dim. The statements revealed new details about China's military buildup and regional expansion the prepared answers to policy questions. The admiral described the Chinese military buildup as "the most ambitious military modernization in the world," and warned "the threat to U.S. forces and bases is substantial and growing." China's submarine forces still lag behind those of the United States but China is making progress in developing quieter submarines. Its air forces are also growing in sophistication with advanced stealth fighters, long-range bombers and advanced unmanned aircraft. Beijing's cyber warfare capabilities are significant and go well beyond intelligence-gathering with plans for attacks on military command and control networks, he said. China also is weaponizing space with missiles, jammers, and lasers capable of killing satellites, key American military power projection tools. The four-star admiral said if confirmed to lead the Pacific Command, he will carry out a buildup of Navy, Army, and Air Force forces in the region to confront the growing threat posed by China, in addition to continuing dangers from North Korea. Current naval forces are insufficient in backing Pacific Command's needs, he said. To deal with China, "the United States should expand the competitive space by investing in next-generation capabilities (e.g., hypersonic technology) while simultaneously recognizing that China is already weaponizing space and cyber," Davidson stated. Outgoing Pacific Command commander, Adm. Harry Harris, has requested priority Pentagon development of a U.S. hypersonic weapon, part of the military conventional prompt strike program. Davidson said he would continue to support a U.S. hypersonic missile to deal with China. "I view the long-range, hypersonic weapon capability that Conventional Prompt Strike would provide as essential to our ability to compete, deter, and win against a strategic competitor such as China," he said. On Wednesday, the Air Force announced the award of a $928 million contract to Lockheed Martin for a hypersonic strike weapon. China has conducted seven tests of a hypersonic glide vehicle fired atop a ballistic missile that travels and maneuvers at speeds of 7,000 miles per hour or greater. The high speeds and maneuverability make the missiles very difficult to target and counter with missile defenses. Russia also is developing hypersonic missiles. 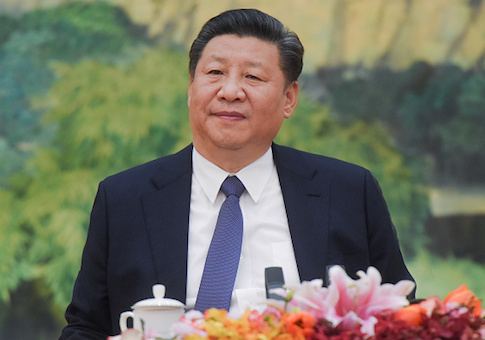 Rick Fisher, a senior fellow at the International Assessment and Strategy Center, said the admiral's comments provide a great service in helping Americans recognize that China is working to shape the world according to its authoritarian model. "Effective leadership can only emerge from such essential recognition of the facts," Fisher said. "On this basis, the Admiral deserves rapid confirmation as he is very much needed in PACOM." In response to China's two new medium- and intermediate-range anti-ship missiles, the United States needs to build similar missiles currently banned under the U.S.-Russian Intermediate-range Nuclear Forces (INF) treaty, Davidson stated. "China continues to improve its ballistic missile capabilities, with the DF-21 and DF-26 missiles offering improved range, accuracy, lethality, and reliability over legacy Chinese systems," he said. "Simultaneously, China is pursuing advanced capabilities (e.g., hypersonic missiles) which the United States has no current defense against," he said. The advanced weapons place U.S. forces across the Indo-Pacific increasingly at risk. Davidson said he favors building missiles banned under INF, a treaty violated by Moscow through the deployment of a new ground-launched cruise missile. Additional missiles are needed beyond the plan for Conventional Prompt Strike weapons. "In the Indo-Pacific, the absence of the INF Treaty would provide additional options to counter China’s existing missile capabilities, complicate adversary decision making, and impose costs by forcing adversaries to spend money on expensive missile defense systems," the admiral said. "I believe the INF treaty today unfairly puts the United States at a disadvantage and places our forces at risk because China is not a signatory." The comments by Davidson urging the United States to jettison the INF treaty likely will be opposed by arms control advocates who want the United States to remain limited by the treaty in the hope Moscow could return to compliance. On China's nuclear buildup, Davidson said the expansion of nuclear forces does not appear to indicate Beijing is abandoning its policy of not being the first to use nuclear arms in a conflict. "China has developed or is developing advanced/precision [intermediate-range ballistic missiles] and [medium-range ballistic missile] systems," he said. "These systems could support a variety of nuclear strike options, tactical-to-strategic and preemptive-to-retaliatory. However, they are not-themselves-indicative of any shift in China's no first use policy." In response to a recent Rand Corp. study that warned the United States risks losing a war with China, Davidson said he has "increasing concerns" about a future conflict. "China has undergone a rapid military modernization over the last three decades and is approaching parity in a number of critical areas; there is no guarantee that the United States would win a future conflict with China," he said, noting U.S. advantages in personnel, training, and joint warfighting. To bolster U.S. warfighting capabilities in Asia, the U.S. military should rapidly develop "high-end" weapons, preserve regional alliances, and continue to recruit high-quality people. Davidson said critical investments are needed in several areas, including undersea warfare, added munitions stockpiles, standoff missiles, including air-to-air, air-to-surface, surface-to-surface, and anti-ship missile. Also needed are intermediate-range cruise missiles, low cost/high capacity cruise missile defenses, hypersonic weapons, air and surface transport systems, cyber capabilities, air-air refueling capacity, and resilient communication and navigation systems. Priorities for the Asia-Pacific weapons buildup are increasing stockpiles of precision guided munitions, submarine warfare systems, counter-missile systems, and more intelligence and surveillance systems. Reflecting the Trump administration's strategic policies that identify China as a threat, Davidson said China is using its development initiative called Belt and Road to advance anti-democratic expansion. "It is increasingly clear that China wants to shape a world aligned with its own authoritarian model," he said. "The predatory nature of many of the loans and initiatives associated with the Belt and Road Initiative (BRI) lead me to believe that Beijing is using BRI as a mechanism to coerce states into greater access and influence for China."